Here is a little Autumn poem by Lana! 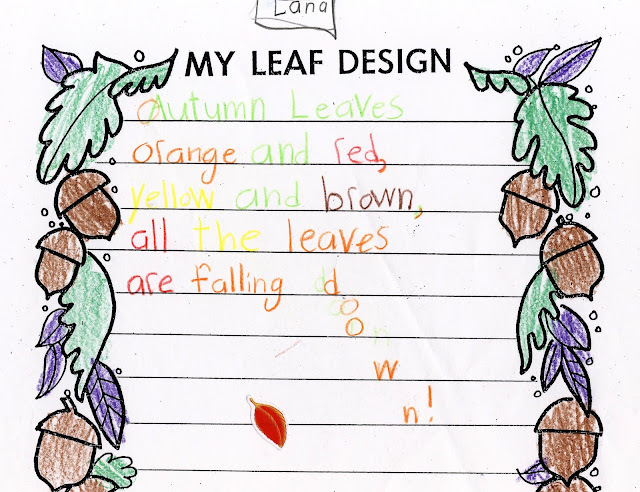 I love how she used all the warm colors of the Fall leaves to write the words of her poem. Beautiful! Today my husband took a half-day of work to visit my midwife for a prenatal appointment. I am currently in my 19th week! Almost half way there! All the girls were home because of Election Day. They were excited for the visit also and I heard them playing "Midwife and Mommy" this morning while I hustled to get ready. The office is a bit of a drive, about 45 minutes. When we arrived, the office was empty. Unfortunately, my midwife had rescheduled with my voice mail, which I had failed to listen to before leaving the house. Bummer. We were looking forward to hearing the baby's heartbeat. Soon though. I feel the beginnings of movement inside, which I love, and my sickness has subsided. I had a string of migraines last week leading up to Halloween but I am passing them off as stress due to costume making and the last-minute preparing for our annual Halloween party. We're looking onward to Thanksgiving now! Turkey and my Mom's homemade stuffing, family gatherings, the delicious smell of bonfires on chilly days, the leaves continuing to fall and the nestling in before Winter. Life is good. What a wonderful poem! Quite the poet/artist. Oh how I remember those first little fluttery feelings. I loved being pregnant!